When you have sensitive teeth, everyday life can be painful. Eating certain foods and beverages, being exposed to cold air, and even brushing your teeth can be miserable experiences. When you know the common causes of tooth sensitivity, you can take appropriate steps to resolve the problem. There are often some changes you can make in your daily oral health routine to help with tooth sensitivity. The first is, brush more gently. Brushing too hard can wear down tooth enamel, and eventually expose the dental nerves. Gentle brushing will clean your teeth without causing damage. You should avoid vigorous scrubbing, and brush your teeth carefully as if you are rubbing a tomato. Toothbrushes with hard bristles can also worsen the problem. A soft-bristle brush is safer and effective. Dental care products containing alcohol can worsen tooth sensitivity as well. Read the labels on your toothpaste and mouthwash, and switch to alcohol-free products if necessary. It’s important to stick to a daily routine. If you skip brushing your teeth, plaque buildup can destroy your tooth enamel. You need to brush and floss every day, and schedule professional cleanings every six months. Teeth grinding is one issue that may destroy tooth enamel and lead to tooth sensitivity. If you grind your teeth during the night, ask your dentist about a mouth guard. Wearing a mouth guard at night can stop teeth grinding and clenching, and lead to less dental issues. In addition, some of your favorite foods and beverages can harm your teeth, expose your nerves, and lead to tooth sensitivity. Acidic products are especially harmful. Citrus fruits and beverages, tomato sauce, coffee, and soda pop are only a few examples. Limit the acidic foods in your diet, and brush your teeth immediately after consuming acidic products. There are numerous underlying dental issues that can make your teeth sensitive. Cavities and tooth decay are two examples that can result in extreme pain. This is another reason it is important to have a dental hygiene appointment every six months—to catch cavities and decay before they worsen and cause more extensive problems. Cracked or chipped teeth, gum disease, or a recent dental procedure can also be responsible for discomfort or sensitivity. You can assess your habits to see if any of them are contributing to tooth sensitivity. If they are, you may need to alter them in the interest of your comfort and dental health. However, you should also consult with your dentist to make sure there are no underlying issues. If tooth sensitivity is extreme or occurs on a regular basis, a complete examination will help determine the cause. In some cases, treatment can be as simple as using a toothpaste that is specifically made for sensitive teeth. In other instances, though, you may need professional treatment that can only be done at the dentist’s office. The good news is tooth sensitivity does not need to be permanent. With the treatment that is appropriate for your particular situation, you can have healthy, pain-free teeth. Once we determine the cause and mend it, you will have fewer limitations, and be able to enjoy life. This means you will not be bothered by cold air, hot or cold foods and beverages, or your daily oral care routines. Contact our office today to set up an appointment and get to the root of your tooth sensitivity. 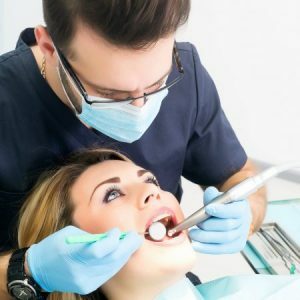 How Can I Kick My “Sweet Tooth” This Holiday Season?When is it Time to Have Wisdom Teeth Removed?